Glencoe Mansion, Museum and Gallery in Radford will be marking its 20th Anniversary on October 13, 2018. • 12:00 pm: Presentation: "Minerals, a Railroad and Civil War Battles in Southwest Virginia"
• 2:00 pm: History Panel Discussion: "The World of the Whartons: Perspectives on Life in Southwest Virginia in the Civil War Era"
• 3:00 pm: Presentation: "Love Among the Ruins: The Confederate Courtship of Gen. GC Wharton and Nannie Radford Wharton"
The milestone will be celebrated with a day of historical and cultural activities, food, the debut of the "1890s Dinner Party" history exhibit and a new art gallery show. Highlighting the event will be three presentations that help place the history of the Glencoe Mansion and of the Radford area into the sweeping story of the Civil War and the post-war period. Among the presenters will be Robert C. Whisonant; Paul Quigley, Director of Virginia Tech’s Center for Civil War Studies; and history professors Dan Thorp and Mary Ferrari. In addition, crafters and artisans will be demonstrating, and local businesses will be showcasing their goods and services including a free yoga class for all levels courtesy of Downey Dog Yoga. Activities will take place on the grounds of the Glencoe Mansion at 600 Unruh Dr. in Radford, and presentations will be at the Radford Public Safety Building, 10 Robertson St., adjacent to the Glencoe grounds. Museum Director Scott Gardner explained that the museum came into existence because of the donation of the historic Wharton home (known as Glencoe) to the City of Radford by Kollmorgen Corporation. Since the building was restored in 1998, the museum has grown to include displays of area historic and cultural importance. "This 20th Anniversary Celebration is intended to re-connect the community with the museum, and to put our local history into a broader context," Gardner said. Part of this broader context has been provided by a remarkable collection of Wharton family documents, saved for posterity by Frits and Sally Wharton van Solkema. Their daughter Sue Bell has brought these documents to light, uncovering new details about the history of the mansion, the Radford area and the Civil War. As part of the day’s activities, historian William C. Davis will highlight information from this collection, telling the story of the Civil War courtship of Gen. Gabriel C. Wharton and his wife Nannie. Additionally, the Wharton Quilt returns to Glencoe! 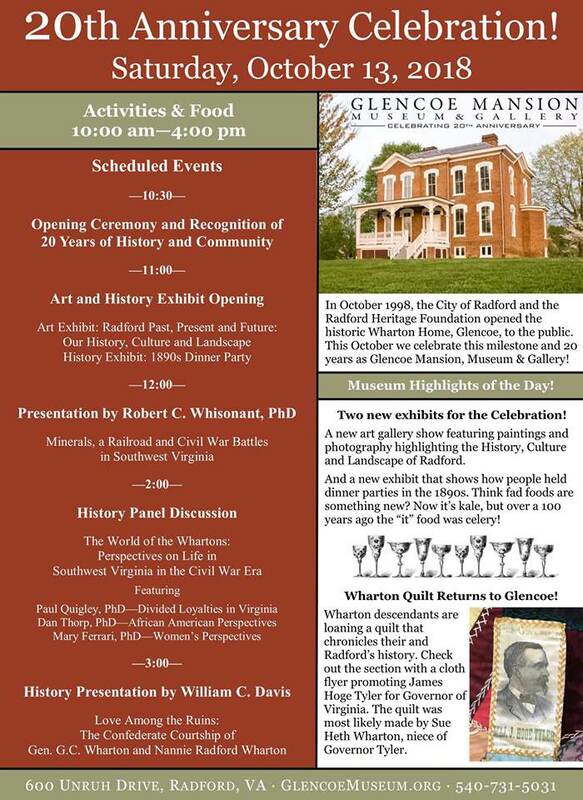 Wharton descendants are loaning a quilt that chronicles the Wharton's and Radford's history. To view the event flyer, visit: https://i.imgur.com/DgyzzE3.jpg. For more information, visit: http://glencoemuseum.org/ or https://www.facebook.com/Glencoe-Mansion-Museum-Gallery-164019760295858/ or contact Scott Gardner via email at info@GlencoeMuseum.org or call 540-731-5031.